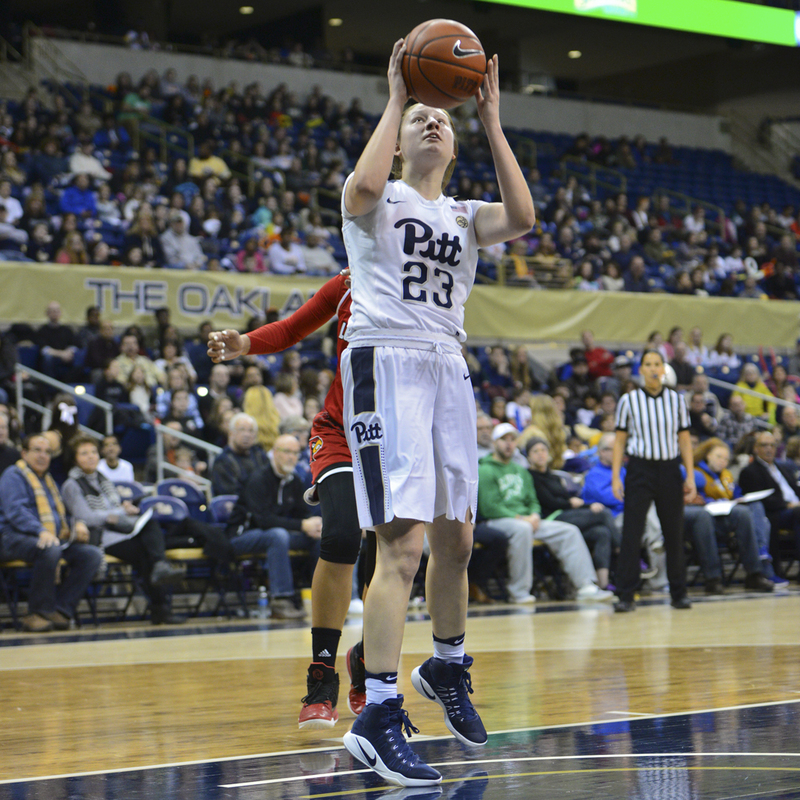 Continuing a recurring theme of the 2016-17 season, the Pitt women’s basketball team put up a fight against a ranked opponent Thursday, but couldn’t finish the job. Pitt led Louisville at halftime last Sunday only to give up the first 14 points of the third quarter and fade down the stretch. The last time the Panthers played the Cardinals, they trailed by two midway through the third quarter before losing, 73-52. Against the No. 24 Syracuse Orange at the Carrier Dome Thursday night, McConnell-Serio watched her team fall into the same pattern that has plagued them throughout ACC play. Pitt (12-10 overall, 3-6 ACC) played a solid first half in Syracuse, but the Orange (16-7 overall, 7-3 ACC) exploded in the third quarter to take control of the game and turn it into a 93-65 blowout. The Panthers have now lost three games in a row, but they have been competitive early on in all three. All six of Pitt’s losses in conference play have come against top-25 teams. Redshirt senior guard Brittney Sykes got the game started with a 3-pointer for Syracuse, then a pair of layups by center Briana Day gave the Orange an early 7-2 advantage. But the Panthers responded with a 10-2 run to take a three-point lead late in the first quarter. After a high-scoring opening quarter, Pitt took an 18-17 lead into the second. The Panthers again found success on offense, scoring another 18 points in the second quarter. But their defense betrayed them, allowing Syracuse to erupt for 25 points. The key play of the half, though, was a fluke that even the best defense couldn’t have prevented. First-year guard Alayna Gribble drained one of her seven 3-pointers to cut Pitt’s deficit to five with a minute left in the first half, then senior guard Alexis Petersen brought the ball up the floor for the Orange. She fired a pass inside, and Panthers sophomore forward Kauai Bradley got a hand on the ball, tipping it into the air at the top of the key. Bradley’s heads-up defensive play backfired, as the redirected pass went straight into the hoop for two points. Petersen then stole the ball on Pitt’s next possession and drove it in for an easy layup, giving Syracuse a 42-33 lead and all the momentum. Another three from Gribble before the half made it 42-36, but just like their last game, the Panthers appeared deflated coming out of the break. The Orange quickly pushed their lead to double digits to start the second half. Pitt went almost four minutes without scoring before Gribble drained a three to cut Syracuse’s lead to 50-39. The Orange then scored 16 straight points over the next 2:45 of game time to make it 66-39 and really put the game out of reach. Syracuse stretched its lead to 30 late in the third quarter, then coasted through the fourth to a 93-65 win. Gribble led the Panthers with a career-high 23 points, and sophomore forwards Kalista Walters and Brenna Wise tallied 17 and 13 points, respectively. But the rest of Pitt’s lineup combined for only 12 points as the team lost its third straight game. The Panthers will travel to Winston-Salem, North Carolina, next to take on the Wake Forest Demon Deacons Sunday at 2 p.m.